This is a two part voting system – Candidate/Referendum Questions are voted by secret ballot from 10:00 am – 2:00 pm. Then resumes at 7:00 pm, where results of the voting are announced and the warrant articles are voted on. 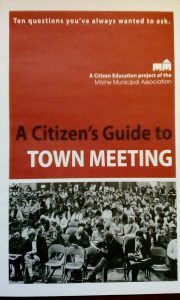 Be informed, read the booklet – A Citizen’s Guide to Town Meeting below. Absentee requests – call 207-793-4348 or come into the office. Drivers license with physical address or other photo ID. If driver’s license lists a Post Office box, proof of residence is required: Proof can be electric bill, lease agreement, vehicle registration etc. Social security number – new voters who do not have a valid Maine Driver’s License or Maine State ID, must list the last four digits of their Social Security Number. For more information, please follow links below.